Patricia has now been missing for five months! Have you any knowledge of Patricia's whereabouts? Police Scotland is continuing to appeal for information from the media and the public to trace a 46-year-old woman who has been missing for five months. Patricia Hendry (46) previously lived in Paisley before relocating to Girvan in October 2017, but has not been seen by family or friends since Monday 13 November 2017. Patricia is described as white, 5ft 10 of slim build and has collar length brown hair. She has a tattoo of two clouds and her name on her left leg and a tattoo of a dolphin of her hip. Chief Inspector Gary I’Anson, Area Commander for South Ayrshire, said: “It is not unusual for Patricia to have limited contact with her family for a period of time, but she was reported as a missing person on March 14 after her family became concerned that so much time had passed without any contact. Her family and friends are incredibly anxious as time passes with no word from her. “In the past, Patricia has lived in Spain and it was originally believed that she had travelled abroad. However, officers carrying out enquiries now believe that she has not left the country. 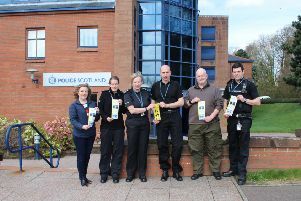 There have been some reported sightings in Ayrshire and Renfrewshire, which officers are now actively following up, but no sightings have been confirmed so far. Anyone with any information should contact Police via 101, quoting incident number 3401 of Wednesday, March 14. Alternatively you can contact CRIMESTOPPERS on 0800 555 111 where information can be given anonymously.